Party guests amazed with Paul's skills as an entertainer. 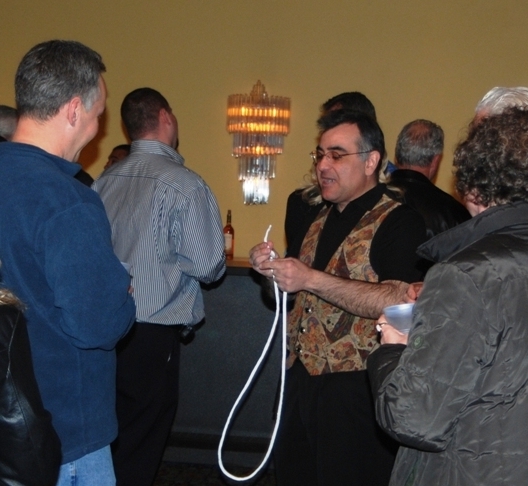 Paul Gallagher is far from your typical "local magician." Having graduated from Yale University and studied at Columbia University, Paul perfected his brand of sophisticated magic for affluent audiences in New York City and the high society neighborhoods of Connecticut. He began entertaining the country club set well before that. At the tender age of nine years old, he was invited to perform at the Elyria Country Club, where his family had a membership. He was a huge success, and was a regular into his teen years at society venues throughout the area. In addition, word spread, and Paul began performing sleight of hand magic and stand-up programs at the homes of many members. What makes Paul such a favorite among people who sometimes feel they've seen it all? How does he impress and stun people who have been to Broadway and Las Vegas? It's always good to associate with people on their level, and with country club and yacht club members, they appreciate the fact that they're being entertained by a Yale graduate who has put forth the effort to become a true master at the cutting edge of his craft. Paul often runs into members who share the same alma maters, and are fascinated that he has taken his abilities and education and effectively applied them to this ancient art. Audiences with sophisticated backgrounds also appreciate sophisticated humor and presentations that touch on current issues. Paul provides a fresh take on what's happening in the world with his magical performances. As one observer commented, "It's so much fun to have Paul (performing magic) at tableside because you can have a really hysterical conversation and be entertained and baffled at the same time!" Paul is available for exclusive adult and family events at your country club, yacht club, or for private events held at your club.